Welcome back! 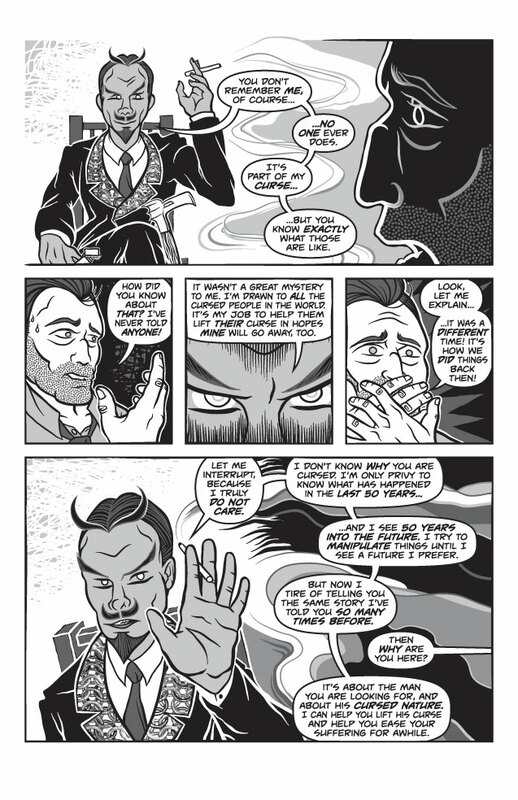 This week, we’re featuring Page 4 of our flagship title Twisted Tales of Two-Fisted Justice! This one’s a real plot-mover…every now and then we need to give ol’ Vic a break from all of the face-punching and alien-shooting so he can indulge in a bit of pleasant conversation. No worries though! Talking just makes Vic thirsty for Justice! And alcohol. Vic is always thirsty for alcohol. Just look at all the clues we’re dropping for Vic Waters’ origin story! Not to mention some good explainin’ vis-à-vis Mr. Century’s unique skills and his role in Vic’s life. In other news, we’ve taken the plunge and purchased an exhibitor table at this year’s S.P.A.C.E. (Small Press & Alternative Comics Expo) in Columbus, OH on April 9 & 10, 2016. Our first convention! Well, at least the first behind the table 🙂 Lots more to come…stay tuned!